A Interim Group Management Report 5 Executive Summary 12 Property-Casualty Insurance Operations 22 Life/Health Insurance Operations 28 Asset Management 32 Corporate and Other 35 Outlook 37 Balance Sheet Review 44 Reconciliations Interim Report Third Quarter and First Nine Months of 2014 Allianz Group 27 Life/Health insurance operations by reportable segments – first nine months Life/Health insurance operations by reportable segments € mn Statutory premiums1 Premiums earned (net) Operating profit (loss) Margin on reserves2 (BPS) internal3 nine months ended 30 September 2014 2013 2014 2013 2014 2013 20144 2013 20144 2013 Germany Life 13,719 12,265 13,719 12,265 8,160 8,298 814 682 57 51 Germany Health 2,437 2,495 2,437 2,495 2,434 2,492 138 144 69 77 Switzerland 1,427 1,353 1,417 1,353 427 395 62 60 61 60 Austria 293 285 293 285 217 209 31 27 92 83 German Speaking Countries 17,876 16,398 17,866 16,398 11,239 11,394 1,045 911 59 55 Italy 8,227 6,294 8,227 6,294 310 322 170 190 43 54 France 6,522 6,354 6,522 6,354 2,649 2,589 378 356 63 63 Benelux5 2,022 1,790 2,022 1,790 380 385 92 82 79 76 Greece 65 68 65 68 38 40 – 1 –8 27 Turkey6 609 244 369 244 106 48 19 10 111 94 Africa 43 42 43 42 20 18 3 3 175 148 Western & Southern Europe 17,489 14,791 17,249 14,791 3,504 3,402 662 641 58 62 Latin America 234 256 251 256 105 117 6 5 85 93 Spain 830 899 822 899 308 341 142 99 261 204 Portugal 183 171 183 171 62 62 15 17 355 426 Iberia & Latin America 1,247 1,326 1,257 1,326 475 520 163 121 248 208 United States 8,810 5,022 9,073 5,022 706 647 529 384 91 74 USA 8,810 5,022 9,073 5,022 706 647 529 384 91 74 Reinsurance LH 423 398 423 398 314 340 35 14 238 86 Global Insurance Lines & Anglo Markets 423 398 423 398 314 340 35 14 238 86 South Korea 1,223 991 1,187 991 380 368 13 17 16 24 Taiwan 1,549 1,352 1,614 1,352 151 114 1 – 3 –8 Indonesia 502 528 602 528 221 191 51 50 551 554 Malaysia 305 271 325 271 132 153 15 13 164 160 Japan – – – – 5 5 1 6 5 38 Other 663 671 711 671 492 504 45 60 171 232 Asia-Pacific 4,243 3,813 4,440 3,813 1,380 1,334 126 147 71 86 Poland 134 78 133 78 54 28 15 12 361 281 Slovakia 189 179 189 179 154 151 29 25 310 281 Hungary 110 134 114 134 33 37 9 7 339 269 Czech Republic 118 104 126 104 54 57 12 13 275 299 Russia 38 57 44 57 37 57 – (1) –8 (54) Croatia 55 45 55 45 54 45 13 3 559 127 Bulgaria 27 25 27 25 24 22 10 3 898 310 Romania 17 17 17 17 10 11 5 1 908 248 Central and Eastern Europe7 687 639 705 639 421 407 92 62 348 245 Middle East and North Africa 123 120 130 120 92 97 15 12 304 288 Global Life 4 5 4 5 1 1 1 – –8 –8 Growth Markets 5,057 4,577 5,278 4,577 1,894 1,839 233 220 111 110 Consolidation9 (925) (852) (925) (852) – – (13) 1 –8 –8 Total 49,977 41,659 50,220 41,659 18,131 18,141 2,655 2,293 70 66 1 Statutory premiums are gross premiums written from sales of life and health insurance policies, as well as gross receipts from sales of unit-linked and other investment-oriented products, in accordance with the statutory accounting practices applicable in the insurer’s home jurisdiction. 2 Represents annualized operating profit (loss) divided by the average of (a) the current quarter-end and previous quarter-end net reserves and (b) the current quarter-end and previous year-end net reserves, where net reserves equal reserves for loss and loss adjustment expenses, reserves for insurance and invest- ment contracts and financial liabilities for unit-linked contracts less reinsurance assets. 3 Statutory premiums adjusted for foreign currency translation and (de-)consolidation effects. 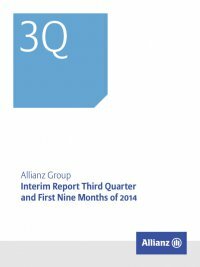 4 Effective 1 January 2014, the ­Allianz Group allocated certain entities from the reportable segment Asset Management to the reportable segments German Speaking Countries, Western & Southern Europe and Growth Markets within the business segment Life/Health and to the reportable segment Banking. 5 Belgium, Luxembourg and the Netherlands are presented as the combined region Benelux. All prior periods are presented accordingly. 6 On 12 July 2013, the ­Allianz Group acquired Yapı Kredi Bank’s 93.94 % shareholding in the Turkish property- casualty insurance company Yapı Kredi Sigorta, including its life and pension insurance subsidiary Yapı Kredi Emeklilik. 7 Contains income and expense items from a management holding and consolidations between countries in this region. 8 Presentation not meaningful. 9 Represents elimination of transactions between ­Allianz Group companies in different geographic regions.